The Define Finite Element Mesh wizard will appear on your screen, where you can configure the properties of the finite element mesh. Specify a unique name for the finite element mesh in the Name text field. The Superelement Mesh represents the main geometry (points and segments) of the model region from which finite elements are generated. A superelement mesh is defined using the model boundary polygon geometry and, optionally, one or more “add-ins”. Add-ins are lines, points or polygons within the model boundary which Visual MODFLOW Flex uses as focal points to create nodes during finite element mesh creation. 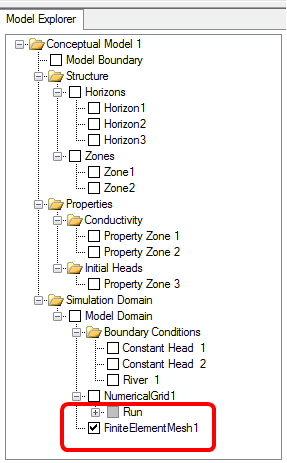 By default, the Add-ins List contains the model boundary and any linear or point boundary condition currently defined for the conceptual model. Additional add-ins may be added to the list using data objects from the Data Explorer. 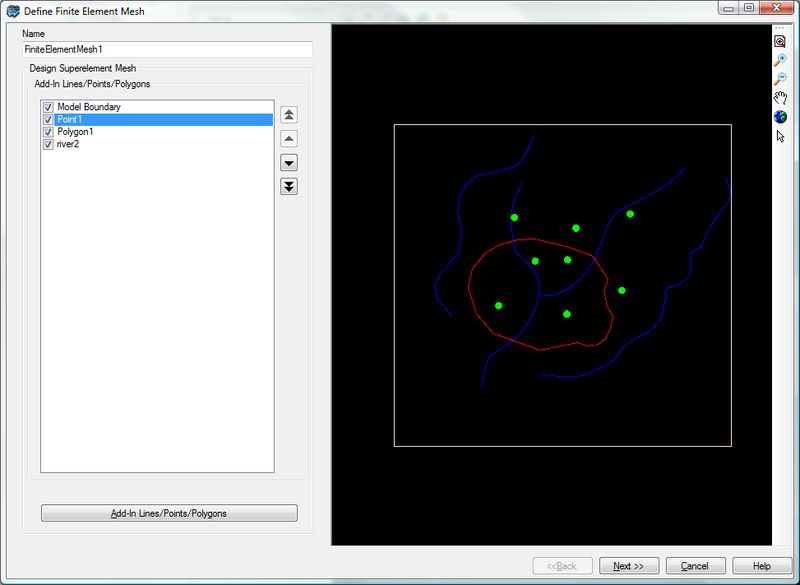 Data object geometry can be edited using the 2D Viewer editing tools. For more information, please see "Digitizing & Editing Geometry in 2D Viewers". •Leaving the Define Finite Element Mesh window open, select the desired data object from the Data Explorer. •In the Define Finite Element Mesh window, select the Add-in Lines/Points/Polygons button, located below the Add-ins List . An Add-in may be included or excluded in the mesh creation, by checking or unchecking the corresponding check box, respectively. When an add-in is “checked” it will also be displayed in the adjacent 2D Viewer preview window. In the second dialog in the Define Finite Element Mesh wizard, you can define various discretization settings for the horizontal mesh. Finite element meshes are created using the Triangle mesh generator, developed by J.R. Shewchuk (1970). Triangle provides various options for generating finite element meshes. These options are described briefly below. Please Note: the switch letters in parenthesis beside the name of each option refers to the command line switches used by the Triangle mesh generator. Delaunay triangulation methods are typically used in finite element mesh generation as they tend to maximize the minimum angle of all the angles of the triangles in the triangulation, providing a nice set of triangles, and avoiding narrow “skinny” triangles. There are three triangulation methods from which to choose from: Constrained, Constrained Conforming and Conforming. •Constrained: Triangulation in which each segment appears as a single edge in the triangulation. As such, segments are not subdivided, and new vertices are not added to the vertex set. A constrained Delaunay triangulation is not truly a Delaunay triangulation, because some of its triangles might not be Delaunay. •Constrained Conforming: Triangulation in which triangles are constrained Delaunay; however, additional vertices may be added to the vertex set and segments may be subdivided to ensure a user-defined Minimum Angle constraint is satisfied. If a minimum angle is not specified, vertices are added to ensure all angles are between 20 and 140 degrees. •Conforming: Triangulation in which each triangle is truly Delaunay, and not just constrained Delaunay. Additional vertices may be added to the vertex set to enforce the Delaunay property. Two Delaunay algorithms are provided for generating the finite element mesh: Divide and Conquer, and Incremental. Typically, the divide and conquer algorithm is preferred. However, if this algorithm fails, use the incremental algorithm. For the Conforming and Constrained Conforming triangulation methods, you can specify the desired number of elements that comprise the finite element mesh. Please note that the specified number of elements cannot be less than the default number generated by Triangle, i.e., the number generated if this option is disabled. For the Constrained Conforming triangulation method, a minimum angle can be specified. The specified angle will replace the default bound on the minimum angle (20 degrees). The specified angle may include a decimal point, but cannot be expressed in exponential notation. •Edges of triangles along model boundary should have approx length: Use this option to set the approximate length of edges (segments) that comprise the model boundary domain. Vertices will be added along the boundary, creating subsegments with the specified length. 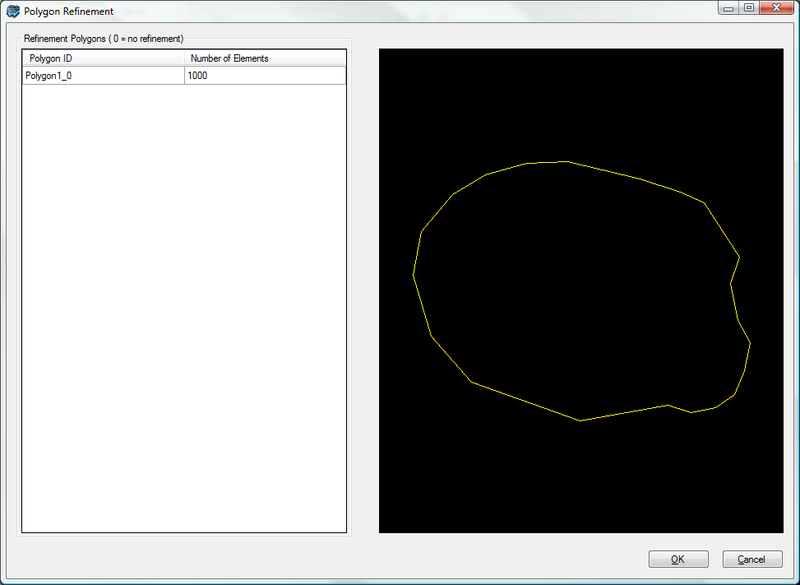 This option will refine the areas along the model domain boundary. •Edges of triangles along line should have approx length: Use this option to set the approximate length of edges of triangles along line add-ins. Vertices will be added along the lines, creating subsegments with a specified length. The option will refine areas around line add-ins. •Refinement around point add-ins: Use this option to refine areas around point add-ins. Refinement for point add-ins is defined by specifying the number of triangles directly around the points, and the desired distance from the point to the new vertices. Use the Gradation slider bar to specify the smoothness of the transition from the fine elements around the points to the coarser elements. A smoother transition will result in more elements, but will lead to more regular elements therefore improved model stability. 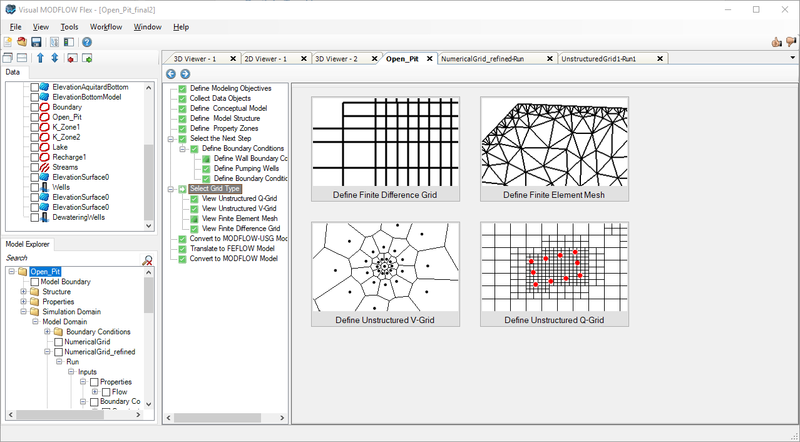 You can use one or more polygon data objects that have been included in the superelement mesh (see "Create Finite Element Mesh) to define localized areas of mesh refinement. To do so, click the Polygons Refinement... button. The Polygon Refinement screen will appear. In the left side of the Polygon Refinement window, all features in the polygon add-ins are listed in a table under the Polygon ID column. When a feature is selected, it is highlighted yellow in the adjacent 2D Viewer. 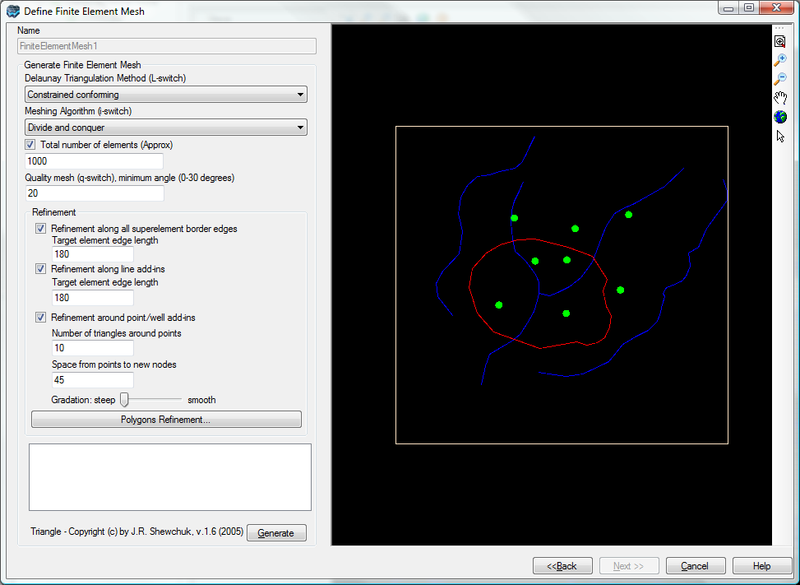 Select the polygon feature that represents that area of the mesh for which refinement is to be performed. In the adjacent field under the Number of Elements column, enter the desired number of element that should exist in polygon area. Visual MODFLOW Flex will automatically refine the underlying triangles to equal the prescribed number of elements for the polygon area. Once you have defined the refinement for the polygon features, click the [OK] button to apply the settings. Once the above settings have been defined, click the [Generate] button to generate the horizontal mesh. Once generated, the Triangle output results, e.g., number of mesh vertices, triangles, edges, etc, are displayed in the text box (above the Generate button). These results may be copied to the clipboard by right-clicking anywhere inside the box, and selecting Copy to Clipboard from the pop-up menu. 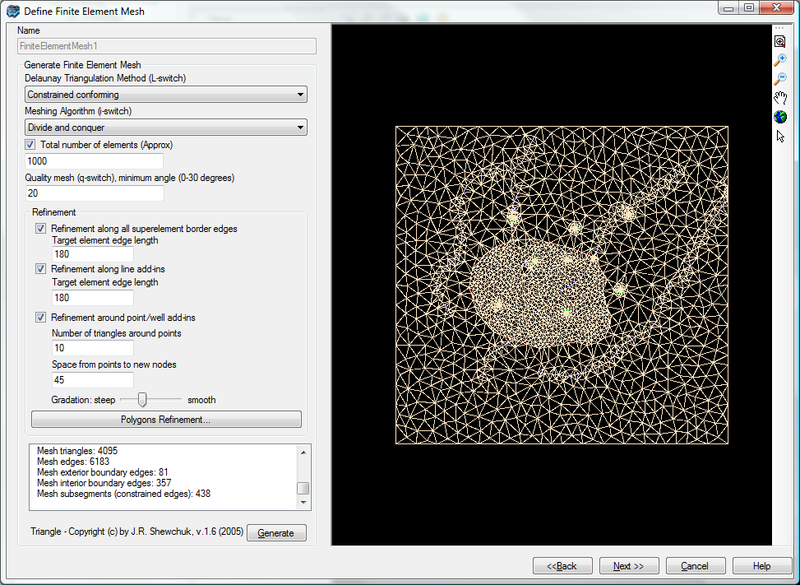 The generated mesh will also display in the adjacent 2D Viewer window. If you are not satisfied with the mesh, you can modify the settings and regenerate the mesh by selecting the Generate button again. If you have selected polygon refinement, the mesh may look something similar to below. The third step in the finite element mesh creation involves defining slice elevations. 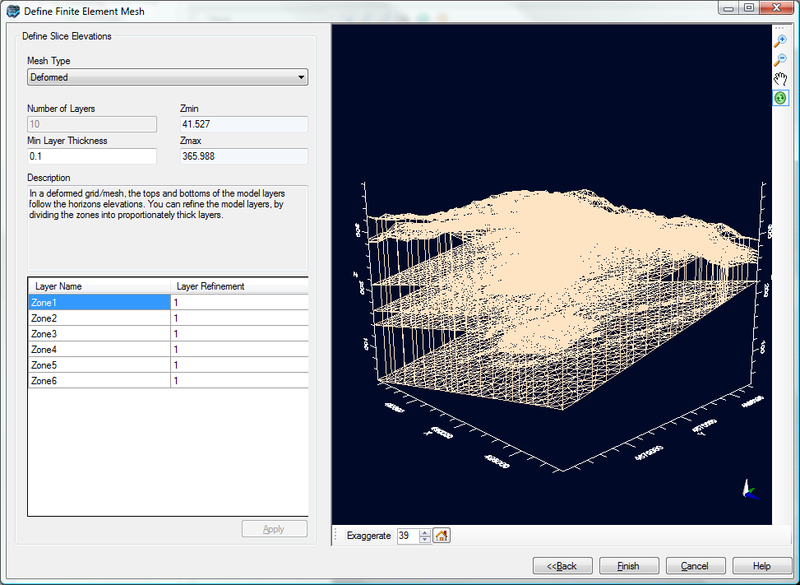 Various settings are available for defining the slice elevations in the third dialog of the finite element mesh creation wizard (shown below). The options available for defining slice elevations are similar to those for defining slice elevations for finite difference grids. For information on these settings, e.g., grid types, min layer thickness and layer refinement, please refer to "Defining the Vertical Grid". Once the vertical mesh settings have been defined, click the [Finish] button to generate the finite element mesh. The finite element mesh will now appear in the Model Explorer tree under the Model Domain node as shown below, where it can be displayed in a 2D or 3D Viewer window, and used in Translation to Finite Element Model.